If you have an idea for a project, what do you do first? Perhaps you have thought about it enough that you can sketch it out or maybe you even have enough experience to begin the preliminaries yourself. For most folks though, just communicating what they have in mind is a new and awkward challenge. This is where the services of a design professional can be most helpful. An experienced designer can help you to solidify and verbalize your vision. Provide creative conceptual insights and practical solutions that you may have never considered. And provide the expertise to guide your vision through the regulatory maze of modern construction. At Takumi Company we feel that design is at best a collaborative exercise. 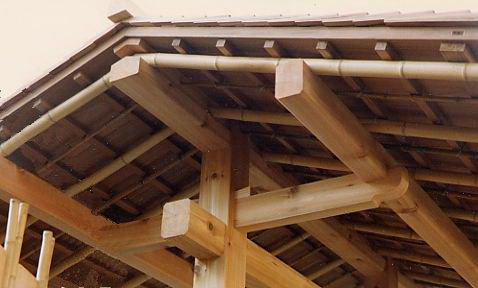 We value communication, taking the time to interpret our clients’ needs and desires, then offering creative concepts based on years of experience building in the Japanese Architectural Tradition. Whether you need minimal consultation or full design development through the permitting process, we can help. Do we work with other design professionals and Architects? In the appropriate situations, yes. Frankly though, it is rare to find an Architect here or in Japan who is qualified in design of traditional Japanese Architecture. Even in modern Japan, the design of traditional architecture is still the domain of builders who have undergone lengthy apprenticeship training. To understand the complex structural details and subtle proportions requires years of repetitive interaction with the process. Studying of books alone invariably results in confusion and misinterpretation. When we do work with an outside Architect, we are typically given a defined space and/or a general concept, then asked to provide detailed design specific to the situation. Again we value clear communication, working hard to insure that consideration is given to the input of all parties involved. No matter the scale or complexity of your project, TAKUMI COMPANY can provide the expertise to carry it to the highest level of fulfillment in design and construction.